Have you ever wanted to walk in the footsteps of the ANZACS? Then this is your chance to speak with the Experts! 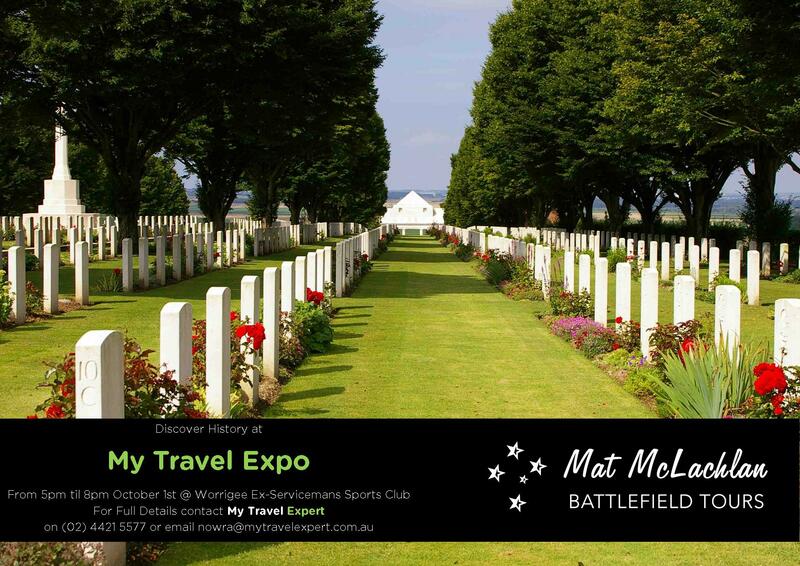 On the 1st October from 5pm to 8pm at Worrigee Ex-Servicemans Sports Club we are hosting the South Coasts largest Travel Expo – My Travel Expo, as part of our Exhibitor list we will have a representative from Matt McLachlan Battlefield Tours – one of Australia’s premier tour operators . Matt McLachlan Battlefield Tours operates some of the best Battlefield re-visitation tours out there with regular departures covering the Western Front and the Gallipoli Campaigns. If you want to visit a specific site, look for a particular grave or attend a memorial event then this is your opportunity to speak to the experts that make it all happen!